The long-term performance of brick masonry enclosures requires technically sound design and quality construction practices supported by diligent maintenance procedures throughout the life of the structure. Provencher_Roy replaced the existing envelope at Montréal Tower with a curtain wall for more transparency. During the work to refurbish and renovate the tower, Québec architectural firm Provencher_Roy updated the existing envelope with a curtain wall—covering 60 per cent of the façade—for more transparency, thereby augmenting the presence of natural light within while respecting the original architecture. Almost all of the tower’s mechanical systems had to be upgraded to bring them up to current building codes and standards, the company says. “It is a privilege to work on such an exceptional site, one that represents so many things for Montréalers. Our design strategy was to showcase the spectacular architectural character of the Montréal Tower, which is still permeated with the Olympic spirit. 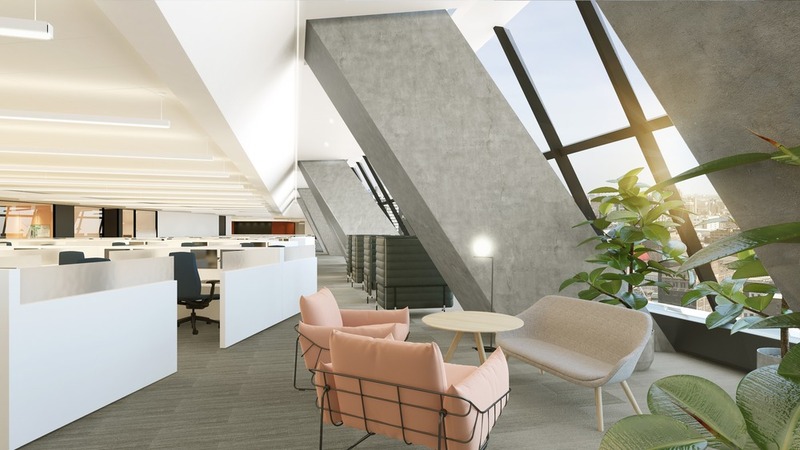 We designed the work space to foster collaboration and knowledge sharing in a healthy environment,” said Julien-Pierre Laurendeau, interior designer at Provencher_Roy. The concrete structure will remain visible and be emphasized by the neutral tones of the walls and ceilings. The areas near the windows will be unobstructed to create an architectural promenade along which employees can enjoy spectacular views of the Olympic stadium and the city. Zones for collaboration and relaxation will also be integrated along the windows. The spacious, luminous rooms will have light grey or marbled floorcoverings. Elsewhere, the detail of the waiting area’s poppy-shaped ceiling will evoke the orange hue of the original retractable roof as seen from the inside. The revamped 13,935-m2 (150,000-sf) Montréal Tower will be inaugurated this summer. Desjardins Movement’s online services’ offices will take up 80 per cent of the rental space at the tower.